In the third estimate of real GDP growth for the fourth quarter of 2014 the Bureau of Economic Analysis (BEA) reported a seasonally adjusted annual rate of 2.2%, unchanged from the second estimate. The composition of growth changed marginally, but the overall performance of the economy in the fourth quarter was unchanged. Upward revisions to personal consumption expenditures (PCE), residential fixed investment (RFI) and exports were offset by downward revisions to business fixed investment and government spending, as well as higher imports (which subtract from GDP growth) and a negative impact from inventory adjustment. GDP grew at an annual rate of 5.0% in the third quarter and 4.6% in the second quarter. While disappointing in comparison to growth in recent quarters this is not a bad report. Growth in PCE, which accounts for 65%-70% of GDP, has accelerated all year. Business fixed investment remains robust and growth in RFI is expected to accelerate based on an improving housing market. Collapsing oil prices have increased consumer purchasing power, which should sustain strength in PCE going forward. An important consideration going forward will be the drag on growth from net exports based on a strong dollar. 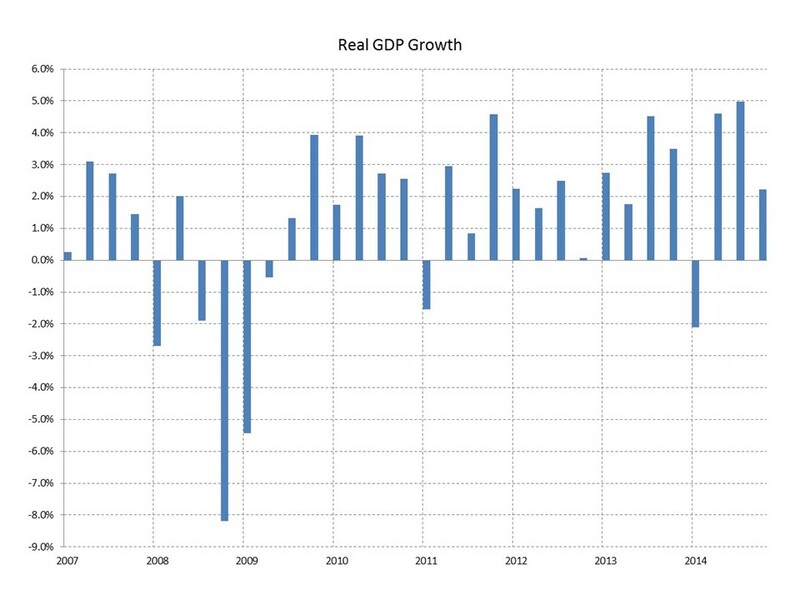 We expect GDP growth to accelerate in 2015 reaching 3% for the year for the first time since the recession ended in 2009.